We have all read the history books, seen the movies and heard the stories about World War II and its aftermath. These are often the stories of the leaders and the front line heroes. However, as the fathers and husbands left for war, most of them never to be seen again, what did that mean for those they left behind? Just like any other war, World War II affected more than just those on the front line. In this biography titled Candlelight in a Storm: Born to be a Berliner, Naveen Sridhar narrates the story of his wife's life during and after the war. From the child who lost her father to the war, being denied access to basic necessities, to making the difficult journey from East to West Berlin, falling in love (with the author) and dealing with the challenges of an interracial relationship, all while living with the political and social challenges of life in post World War II Germany. 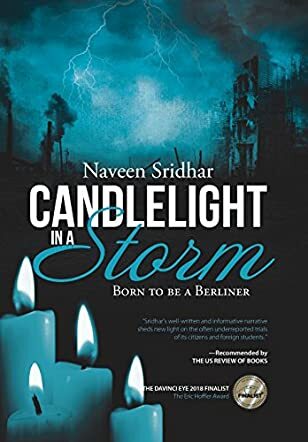 Candlelight in a Storm: Born to be a Berliner by Naveen Sridhar focuses on the human side of World War II to tell the story of the ordinary civilians. Renate's story is not unique to her alone. Many lived the same life as she did. Her story gives a voice to the many unsung heroes of World War II whose stories were never told. Naveen Sridhar's broad knowledge of the subject is evident and as much as his wife's journey is at the center of the narration, the full story is bigger than her. This is the story of an entire people. Amid all this, however, Naveen and Renate's relationship delivers an important message of hope - that love conquers all!